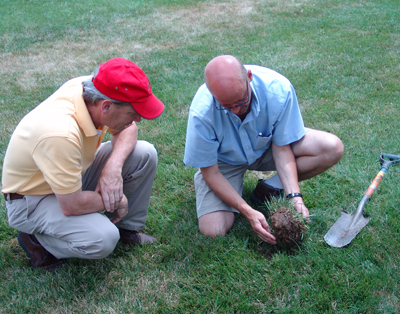 Following a full day of soil science education and information exchange with consultant Eric “T” Fleisher, Swarthmore College’s Organic Lawn Care Initiative is one step closer to implementation. As I discussed in my last blog post, I am spending my summer internship helping the Grounds Department and Scott Arboretum transition the five-acre Mertz field into an organic lawn, and Monday, July 12 was a critical day in this process. T’s visit is the first pass toward a feasible and effective detailed program design. We approached T after hearing about his work on Harvard University’s Soils Restoration Project, upon which our program is roughly based. T is the Director of Horticulture at the 37-acre Battery Park City Parks Conservancy (BPCPC) in lower Manhattan. Since 1989, he has been guiding the organization in the use of sustainable grounds management methods, based on the development of a balanced soil ecology, with an emphasis on composting, water conservation, and the use of non-toxic means of pest and disease control. BPCPC is the only public garden space in New York City to be maintained completely organically. 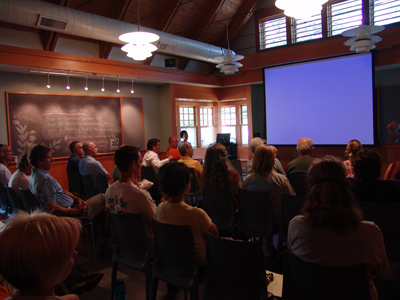 T began his Swarthmore visit with a presentation and question and answer session on his experience with organic horticultural practices. It was attended by 35 representatives of our staff, the college Sustainability Committee, the Pennsylvania Horticultural Society, local public gardens, Penn State research and extension centers, and local turf care companies. He explained to the audience that pioneering new techniques for managing environmental systems is an adaptive, rather than technical, challenge. Exploring new sustainable management practices requires philosophical and behavioral changes, moving beyond the established “quick-fix” answers that are effective in 85-90% of situations. Applied to organic lawn care, an adaptive approach means understanding the turf as an environmental system before making any amendments. To attain this perspective, T spent the afternoon conducting a comprehensive site assessment. We gave him a tour of our compost facilities, showed him where we plan to install two solar-powered compost rotators, our compost tea brewing station, and explained what equipment and resources we own or have access to. Then, similar to what I performed last month, T used a spade to gather more soil samples. This set will be sent to a lab called Soil Foodweb, which specializes in biological content testing. Once the tests establish what microorganisms are already present in our soil and compost, T will help us further develop and modify our composting program (already 80% of the way there! ), create the compost tea recipes that will best foster natural nutrient cycles in the soil, and adapt our irrigation, aerating, and mowing practices. T successfully uses organic management programs to restore the health of ailing landscapes. 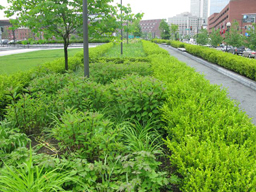 When the conventional strategy of adding more water, fertilizers, and pesticides to their dying boxwood hedges proved ineffective, the Kennedy Greenway Conservancy in Boston hired T as a private consultant. He soon discovered that the soil, recently disrupted by construction, had very poor natural nutrient cycling and was therefore unable to retain nutrients and nourish plants. Consequently, the boxwood root systems had weakened. T helped the Greenway Conservancy horticultural staff brew a bacteria- and protozoa-rich compost tea, which they injected into the soil. Beneficial bacteria incorporate nitrogen into their biomass, preventing it from leaching out of the soil. Protozoa feed on these bacteria, metabolizing their carbon and nitrogen content at a ratio of 30:1. They release excess nitrogen as ammonium (NH4) waste, a form readily utilized by plants. Their roots, in turn, exude substances that nourish bacterial populations. 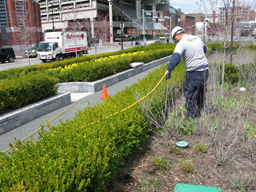 As the compost tea reestablished this natural nutrient cycle in the Kennedy Greenway Conservancy soil, the shrubs rapidly regained their health. 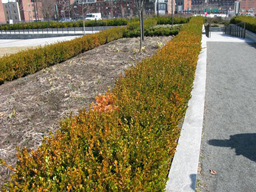 Within two months, Boston enjoyed green, vigorous boxwoods in its newest park. Though T is skilled with advanced monitoring and testing equipment, he maintains that the best diagnostic tools are a spade, a soil corer, and his hands, nose, and eyes. 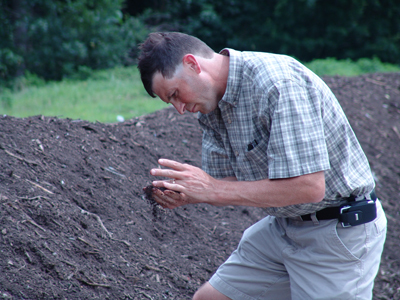 Rubbing dirt from each of the three zones between his fingers and carefully examining its color, T made an estimate of the soil texture (the ratio of sand to silt to clay present) that almost exactly matched the UMass lab results: silt loam in the upper and lower thirds and loam in the middle. Explaining that a very silty soil is an obstacle to easy infiltration, T was not surprised to hear that our cation exchange capacity (CEC) levels are low. CEC is a measure of the soil’s ability to retain and supply negatively charged nutrients such as calcium, magnesium, and potassium to plant roots. These nutrients cling to finely divided organic matter and clay particles in the soil. The microbes added to the soil in the liquid biological amendment (compost tea) will mitigate the effects of our low CEC by fixing these nutrients in their bodies. 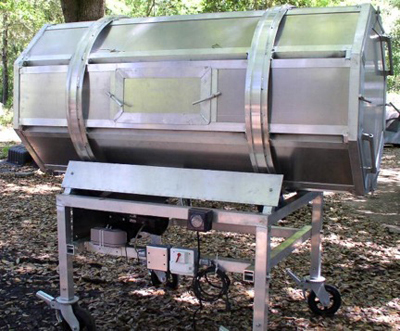 If their contribution is still not sufficient, we will add bulk compost to raise the level of organic matter present. 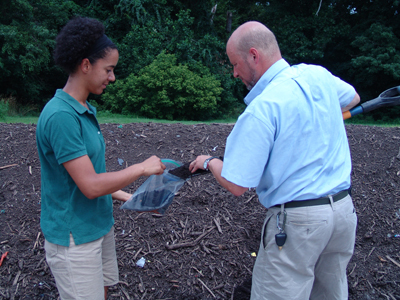 The success of both efforts relies entirely on the quality of the compost we produce. At the municipal compost facility, T and the other turf specialists reached into the middle of the maturing windrows, feeling the heat of the pile and extracting a handful of the rich, decomposing material for closer examination. In order to kill any weed seeds that might be mixed into the compost, the heap needs to be kept at a temperature of over 130º Fahrenheit for at least two weeks. If it strays above 160º, however, or does not receive enough air, anaerobic conditions alter the biodegradation process. The simplest method of detecting anaerobic compost, T taught us, is by smelling it: its hydrogen sulfide byproducts produce a scent similar to rotting eggs. In addition to discussing the technical details of our program, we also engaged T in a planning session on the study and documentation of our lawn care transition. 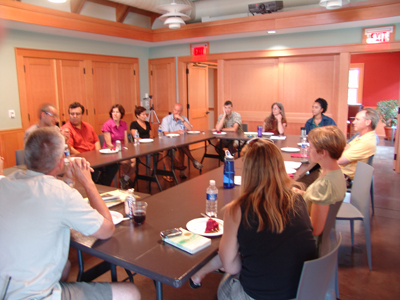 Several professors and college community members joined us for lunch in a dialogue about prospective research projects, curricular tie-ins, and institutional assimilation. They entered a vigorous discussion about the feasibility and value of a scientifically rigorous approach versus a more qualitative life cycle assessment or demonstrative study. Regardless of which experimental design proves most suitable, we plan on monitoring changes in root development, thatch volume, turf density, soil compaction, irrigation requirements, and nitrates, phosphates, and pH levels in the soil and surface runoff. I will work with other students, faculty, and specialists to develop appropriate and replicable techniques to gather and analyze this data. Examples of new equipment for the organic lawn project. From top to bottom: an Aeravator, lysimeter and hand pump, and a solar-powered rotary composter. 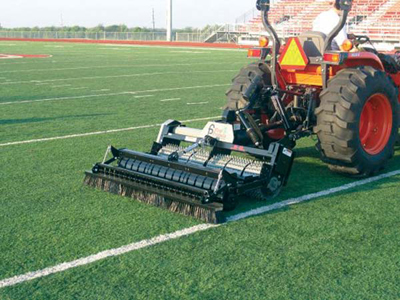 Based on T’s preliminary feedback and recommendations, the Grounds Department will begin researching and acquiring specific equipment, such as a pump for the compost tea brewer and an Aeravator to fracture deeply compacted soil with thin, vibrating metal tines. Andy Bastian ‘12, an intern with the Engineering Department, is hard at work assembling and modifying the design of two solar powered compost tumblers. Professor Carr Everbach is helping me calibrate and install a set of lysimeters to collect soil water samples to look at nutrient levels at different depths in the soil. By the time T returns in the early fall, our capacity to carry out and monitor an organic lawn care program will be significantly greater! To learn more about T’s work, consider joining the Arboretum trip to Battery Park City Parks Conservancy on October 6th or attending his next lecture here at Swarthmore at the Perennial Plants Conference on October 15th. Magnificent web site. A lot of useful information here. I’m sending it to a few friends ans also sharing in delicious. And certainly, thanks for your sweat! Hi! Mr T is indeed magnificent because of the projects he did on organic fertilizers. I would just like to know any data regarding the water savings and the less cutting of turf and/or plants incurred in using aerated compost tea? I would be most elated to know those. Thank you so much! *I find this also essential to future aspriring project proposer like me regarding the return of investment for using such.